View of sculpture 'Dreaming Spires', outside Omni Centre. Greenside Place, Edinburgh. 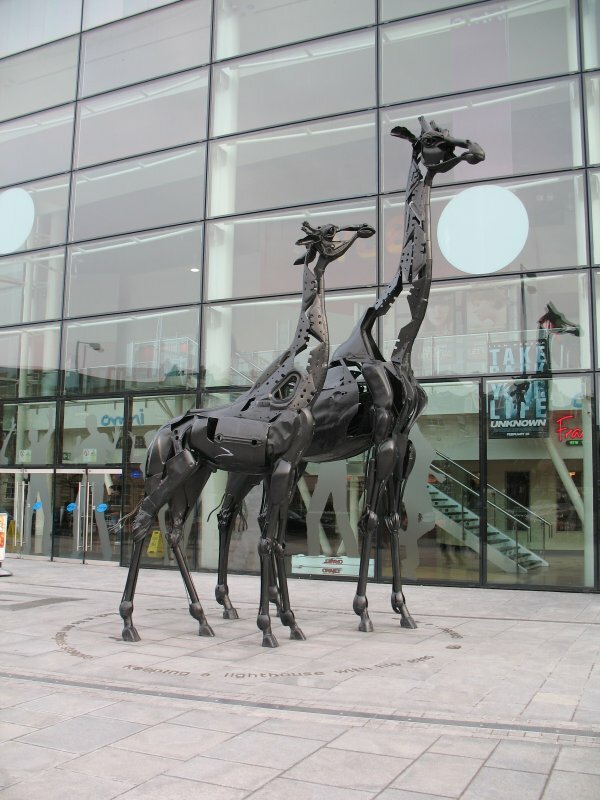 Two open-work metal giraffes, a mother and calf, stand in front of the glass façade of the Omni Centre, within a circle of bronze letters (a poem by Roy Campbell) on the pavement. The giraffes tower above passers-by who share the pavement with them, and look south towrds the east end of Princes Street, rather like tourists deciding which way to go. Their bodies are constructed of mainly curvilinear forms and open spaces. Some surfaces are textured, others volumetric. The recycled metal (discarded parts of motorbikes and cars) is unified by black paint, yet the overall impression is of a light and lively public sculpture. In 2004 the Omni Centre invited six artists to design a sculpture related to the history of the site. According to Helen Denerley 'it seemed like the site was crying out for giraffes.' (1) She was awarded the commission at the end of 2004, but did not start work on the sculpture until January 2005. It was completed in June 2005, then transported to Cumbernauld to be galvanised, painted and assembled. It cost £50,000 and is officially titled 'Dreaming Spires', but affectionately known by the sculptor Helen Denerley and her team, as Martha and Gilbert. In August 2005 various newspapers reported that the smaller giraffe's tail had been vandalised. According to Helen Denerley, the tail just unravelled through people touching it. She welded a steel band around the tail to prevent it unravelling further.